No matter how hard he tries, this baby cow can’t nurse from his mom. With a large plastic ring around his nose, he tries time and time again to drink some milk, but the device keeps covering his little suckling mouth. This was the sad scene captured on video at what appears to be a dairy or beef farm — and it’s since gone viral with over 4 million views online. The calf is clearly frustrated that he’s being forced away from nursing, and Susie Coston, national shelter director for Farm Sanctuary, says there’s a heartbreaking reason why. 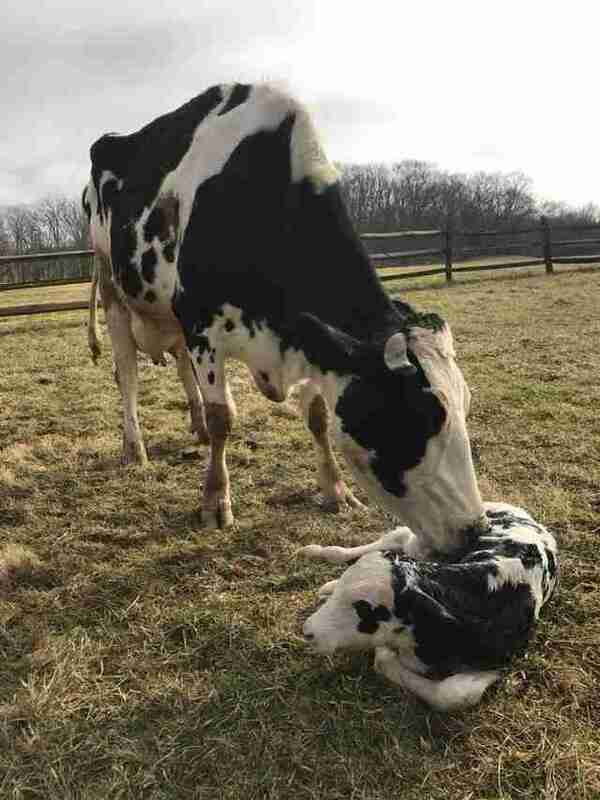 According to the USDA, more than 65 percent of calves born on dairy farms are separated from their mothers immediately after birth. The Humane Society of the United States notes that this abrupt separation can distress the calves, and they may cry so much that their throats become irritated and inflamed. This stress can take a toll on the calf’s immune system for several weeks, researchers found. In the case of the beef industry, calves such as the one in the video are forcibly weaned from their mothers, sometimes using a nose plate, in order to be sent to a feedlot where they will be confined and fed a diet of grain to make them gain weight for slaughter. The mother cows remain on the farm to continue having calf after calf in order to produce milk. When she’s too old to have babies, she will likely have the same fate as her sons. Coston sees this herself each day in a rescued mother and son living at Farm Sanctuary’s New York campus. Liz the cow and her then-newborn son, Cashew, came to the sanctuary two years ago. Cashew is a young adult now, but he still nurses from time to time since his mom’s still producing milk for him. 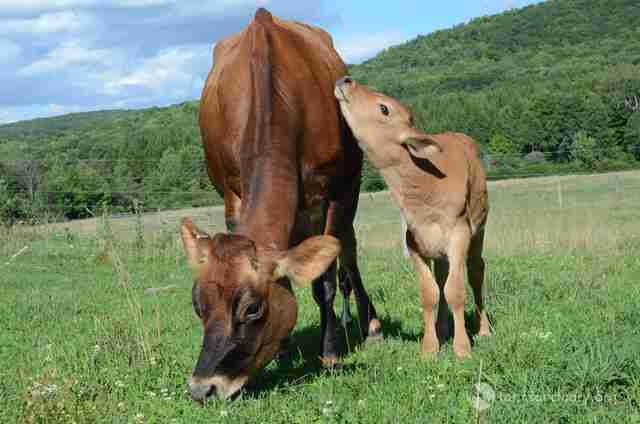 Liz also became the adoptive mom of a calf named Jerome after he arrived at the sanctuary, who at the time was a newborn who had been separated from his mom at a dairy farm. Liz, Cashew and Jerome will get to be together as a family for life — a joyful fate that the majority of cows will never get to experience. To support all the rescued cows at Farm Sanctuary, you can make a donation here.